I'd been invited to attend Malay Wedding several times by my friends. The bride and groom were treated like a royalty on that day. They were seated at the stage with glittering outfits, decorations, live performances, foods and people chatting at every corners. The scene I would never forget is the Malay's bride and groom wedding outfit. It seems that the theme of the party in term of color and shape in sync with the couple's outfit. So if the couple wearing green and purple outfit for example, I will see green and purple color in other elements like flowers, cake, table and room decorations, and so on. They are all beautiful! I captured one of those moments in Malay wedding by creating a mini figurine of the bride and groom. Hope you like it. Air dry clay in green, purple, black, and skin color. You can make your own clay with my modeling clay recipes or buy the clay. Gold and silver glitter glue. Pearl beads and jewelry pins. For the body, make a clay cone shape in green color and then split the bottom into 2 with your scissor. Close them back and let it dry. Roll two small cone shape for the arm. Roll a small pipe shape of green clay and flatten it. Paste it on top of the body as a collar. Take your skin clay color, roll 2 small oval shapes, flatten it and cut to make a thumb. Attach it to the arm with white glue. Mold the ceremonial knife from slightly darker green color to a small sausage shape, bend it and paste to the groom's body. For the body wrapper (Sarung) I used purple color clay. make a pipe shape and than flatten it with clay rolling pin. Decorate this with gold glitter glue and wrap it around the body. Roll a ball shape clay in skin color, and indent the middle of the ball with your finger. Insert toothpick to hold the head until it's dry. Attach the nose, ears and draw the eyes with black marker. Cover the head with black clay and draw the lines for hair. Roll the green clay to pipe shape with length according to the head diameter, flatten it and cut to triangle shape. Add purple color rope and flatten it again together with the green clay and wrap around the head. Decorate the head cover with gold glitter glue after the clay dry. Start with a cone clay shape for the body. Let it dry. Roll a thin layer of clay for dress with the length slightly shorter than the body. Make a fabric texture by using texture rolling pin, real fabric texture, needle, or anything that can be used around you. Wrap it around the body. Roll two skin clay color to oval shape, flatten it and cut for the thumb and attach it to the arms. For the shawl, roll purple color clay and decorate with gold glitter glue. Make the head shape similar to the groom, draw the feature and add the hair with curly fringe on the forehead. Add the hair accessories from silver beads, jewelry pins and also add silver glitter glue. 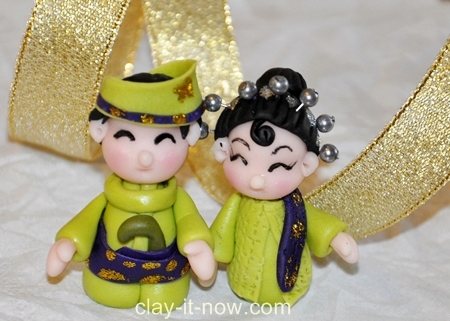 When the bodies and heads are dry, join them with white glue and you have bride and groom mini figurine that you can normally see at Malay wedding ceremony. Do you have question or comments? Please contact us and we'll be happy to communicate with you.